“I am the candidate against all the above”. Photo courtesy of ksenia-sobchak.com. All rights reserved.I felt that something was wrong back in July. It was during the children’s “Direct Line” with President Putin. A girl from Sochi’s Sirius centre for gifted children asked — out of nowhere — what the president’s attitude to feminism was. Without blinking, Putin stated that feminism has been around for a while and that it has some useful qualities. “It’s good to defend women’s rights, we just don’t need to go crazy with it.” The conversation was for children, but the rules were for adults. The Russian President always decides for himself which questions he’s going to answer on a given day. The girl’s interest in feminism surprised me, but definitely not Putin. Earlier in the year, on International Women’s Day, Prime Minister Dmitry Medvedev confirmed a National Women’s Strategy for Russia up until 2022. Recently, Valentina Matvienko, Speaker of the Federation Council, has started mentioning women’s rights more often — for instance, loudly applauding female appointments in the world. And then in July, Vyacheslav Volodin, Speaker of the Russian Parliament, dug up his draft legislation (previously amended, then declined) on the equality of men and women and began insisting on having this 14-year-old bill made into law. The conspiracy theorist of a feminist inclination inside me assumed that this topic was going to emerge in the Russian presidential campaign. It turns out that the Kremlin was simply looking for a woman. The “human resource” decisions of the president and his administration are not bereft of cunning. If Ksenia Sobchak didn’t exist, they would have had to invent her. Putin wanted to liven up his own elections, as even in his own fantasies they looked deadly boring. Sobchak’s soundbites about how she’s decided to campaign against everyone in the Russian presidential elections are catchy, but it’s a cunning move. To treat the Russian president and his older competitors, from Communist Party leader Gennady Zyuganov to radical populist Vladimir Zhirinovsky (for both of whom it’s already physically difficult to take part in the race) means one thing: not to campaign against the president, although that’s what people should expect in a democratic contest. Committed to her campaign, but biographically loyal, the energetic 35 year-old Sobchak is grateful to Putin for his commitment to her father, Anatoly Sobchak. (She is currently making a film about him in honour of a highly relevant anniversary.) She can be temperamental, but knows her place. She is oppositional, but looks like an artist’s satire of the opposition. A person capable of both breaking and not breaking the rules at the same time. She is very recognisable, but rather unpopular: Sobchak has never been bothered by negative ratings, she’s even made jokes about them, and has successfully monetised them. “I’m a woman,” Sobchak confirms as she writes a whole paragraph for an article in Vedomosti on the women’s agenda. She comes out for increasing women’s wages (which are roughly 30% lower than men’s) and for equal access to all professions, as women in Russia are banned from nearly 500 jobs. Women deserve to have their voice heard for the first time in 14 years. The last time was 2004, when Irina Khakamada ran in the presidential race. The problem is that Sobchak and her political operatives don’t know that much about women’s rights. 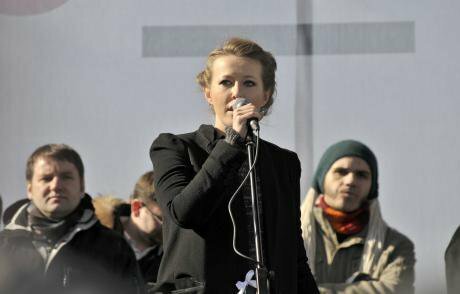 Sobchak’s electoral programme refers directly to biology: women are naturally more inclined to negotiate than men, as the latter are torn by their thirst for blood and egotism. How is this any different from the Google employee’s gender memo? Indeed, there’s a lot of confused messages on the women’s agenda from the women’s candidate: take, for example, the recent conflict between Aeroflot and its stewardesses, whom the company tried to fire on grounds of their age and weight. Here, Sobchak insists on defending Aeroflot, and the head office of L’Officiel magazine should shiver at the phrase “fat stewardess” from the lips of the editor-in-chief of its Russian franchise. Political correctness (in contrast to self-irony) is, in general, not Sobchak’s strongest suit. Sobchak is so active in her fight against hypocrisy that she didn’t mind outing her friend, a popular TV host who wasn’t even in politics — he just wound up in the crosshairs. Why do we need to believe in this “women’s agenda”, to see it as an appeal to our hearts rather than a set-up? It’s not a bad thing when someone promotes fighting for your rights by their own actions. But what’s the use of the fake paternity leave taken by TV host Andrei Malakhov or prominent businessman Vladimir Kekhman? There’s a strong sense that they’re having us on. The Russian president has said many times that, yes, both gays and women work for him. To be fair, Putin does prefer to hide from the former in the shower, and he believes that the lives of the latter consist solely of “bad days”. Women have worked their way to the top of the Russian state — chairperson of the federation council Valentina Matvienko, head of the central bank Elvira Nabiullina and head of the accounts chamber Tatiana Golikova act as evidence of career equality. The problem is that the state system in principle does not assume an independent position of the person who carries out tasks. It doesn’t matter if you’re a man or woman, everyone acts in obedient deference to their boss, who sees himself, at minimum, a great infantry leader with a masculine torso. The Russian authorities are strange: when they speak about domestic violence, they say don’t air your dirty laundry in public, they are frightened of naked people on stage like fire, and persecute homosexuality both in court and on the street. In this sense, women in the Russian state have always performed the role of “women” — moreover, in the most popular understanding of the word. You want laws in defence of childhood? Here’s Elena Mizulina with her raft of “mother’s laws”, which cleanses the internet — and teenage sexuality — from corrupting influences. Do we need to deprive US citizens the right to adoption? Here’s Valentina Petrenko, a woman with a good, patriotic heart. There’s a particularly vaudevillian sensibility when you realise the campaign against the film Matilda was organised by Natalia Poklonskaya, a State Duma deputy who’s in love with Tsar Nicholas II, and the Minister of Education is Olga Vasileva, a traditionalist who loves children’s chess. And when it comes to the Minister of Culture, when they start talking about replacing him, then they love to say that it’d be good to appoint a woman to the job — it’s still a big deal, but has a softer touch. Do we want a female quota for the Russian state, whereby women have to put on the “woman’s costume” and carry out work that is so far from humanism? No, we’re against having robot assistants with female voices. This article was originally published in Wonderzine in Russian.